Couple of weeks ago was the annual book sale at the local library. Look what I picked up from the Free boxes! Copyright 1929, original price, ten cents. I have no idea what I'll use it for. But it's got great 3-D illustrations of overall framing systems and close-up details. I have to half wonder what, if any of it, is not up to present Code. 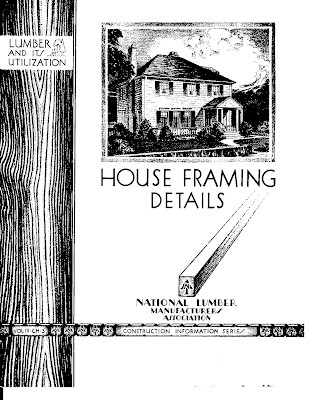 But it's just as likely, a house framed as described in this booklet would today be considered overbuilt.
. . . Oh, hey, it's got a detail on laying a ceramic tile floor flush with your main floor by dropping the subfloor on ledgers between your floor joists. Hmm, very interesting . . . I was able to take these without using the macro setting on my camera. Which is progress. I've put a call and an email in to the grower yesterday about poor "Velma's Royal Delight." I hope something can be done about replacing it this season. There's a great staring hole in my front border. Monday evening I set the sprinkler to give my front yard a good drenching. It hadn't rained for a week and a half, I'd laid down fertilizer (organic) the previous Thursday, and the lawn and the plantings needed some help. I positioned the sprinkler so it wouldn't splash in the front windows, and let it go a good hour and a half. Maybe two hours. This afternoon, then (or yesterday afternoon, by now), I went down the basement to get the wrenches to replace my lawn mower blade. Sniff, sniff! This basement smells musty. Didn't smell that way yesterday . . . I wonder, what--? Opened the door to my workshop, turned on the light, and oh, yuck! Water seepage all along the wall at the front of the house! Boy, ain't I clever! I may have adjusted the sprinkler position so the water wasn't hitting the windows, but it was hitting the foundation square on! Not to be confused with the Three Stooges' "Yuk-yuk-yuk!"! I'm not in a position to call in any of the basement waterproofing guys I interviewed a year or so ago. But I have taken the advice of one of them (the last one) and ordered a second dehumidifier specifically for the workshop. Wish I dared get the brand with the pump and hose I can feed to the outside. But it gets such bad reviews at Amazon.com. I'm having to setting for a model I'll have to empty by hand, since the only drain is at the other end of the basement. A pain in the whatsit, but what can you do? I knew I was going to have to get a dehumidifier for that room now that the hot weather has begun; I just didn't think that I and my lawn sprinkler were going to set it such a formidible inaugural task. I think we're making some progress in the lagerstroemia department. Though I'm still not satisfied re: possible cases of mistaken identity. Today we have an addition to the overall view. I dumped in the Siberian iris I was given by my friend Hannah's* mother-in-law. We'll see if they're happy there. They obviously were happy enough in the plastic grocery sack in my garden cart to start blooming! "Bayou Marie" has caught hold, but I'd like to see it bigger, faster. Maybe it's developing its roots? You'll notice I cut the twigs off all the ones in the bed by the sidewalk. I first wanted to make absolutely sure I couldn't expect any new leaves off the upper branches of the old growth. This plant doesn't work that way, so today the twigs got the ax. Or the secateurs, rather. I'm afraid "Velma's Royal Delight" seems to be une infante defuncte. A sad and stately pavane may be in order; more likely, a phone call to the grower in Florida. No spurge or sorrel, too. ’Matoes, beans, and peas, oo-hoo! And this garden might be fun! Call this an excuse for not posting for awhile, but when it comes to working on my house and garden, I find a strong imagination to be a dire handicap. I'm so good at imagining and visualizing what things are going to look like when I've got them finished, that when I finally get out there and accomplish the work, I have no sense of satisfaction. It's like, "Hey, wasn't it like that all along? What's the big deal?" Or I obsess about it in my sleep, dreaming about mixing soil or digging out roots or finally finding places for and planting all the flowers I was given by my friend Hannah's* mother-in-law two weeks ago, and then I wake up and yeah, now I actually gotta do it, except it means two more trips to the garden center for mushroom compost and cow poop-- ye gods, I'm broke and I'm spending my money on dirt!! ?-- and more rock and root removal. And then I think, Dammit, just do it, but it rains solid for a week. And then it doesn't rain for a week and the soil turns to dust and I don't want to pay the borough's inflated sewer rates watering the garden, but I have to do it anyway, if I don't want all the new vegetable plants to die. All right, though. I still have the beans, squash, and cantaloupe to plant in the vegetable garden. But I do have the tomatoes (Brandywine and grape) in, and the bell peppers (red and yellow), yellow and red onions, regular and pickling cucumbers, broccoli, and celery (that last is me getting adventurous). Oh, yes, and the volunteer lettuce. In the front border, the peonies and balloon flowers I transplanted last November are up and prospering (surprise! thought I'd drowned them!). They've been joined by delphiniums and sweet Williams from the cooperative extension's master gardeners' plant sale, Mona Lavendar plectanthrus from the garden center, and dead nettle and some other low-growing whatever-it-is from my friend's mother-in-law. The poppies are at it, but the front border crape myrtle isn't doing anything. Rot. I've received my order of three ground-cover roses in the post three (or four?) days ago that'll go in with them, if I haven't killed them stone dead. I was screamingly busy this weekend and I forgot they were coming in little pots, not bareroot. So I just left them in the unopened box, on the dining room table. Where my big cat lay on it, keeping them nice and warm . . . I've liberated the pots and put them on the back porch, watered, hopefully to recover for planting tomorrow. Some of the donated gooseneck loosestrife went in the backyard border next to the house this evening. I figure I want something vigorous and agressive there, and if it invades the grass-- well, what grass? That's where I'm always trampling it down on the way to the rain barrel. Which is finally full again, because it rained all afternoon and evening. Too bad! Planted the gooseneck in it, and then half the tall phlox I was given. That went next to the giant alliums in the far end of the west border. But in my imagination this is all perfectly done! At least two weeks ago! Which does my sense of accomplishment no good at all.